ACS FCO is a new generation, clear, waterborne, surface applied, fire retardant impregnation liquid for protecting undecorated timber and timber related substrates. The product is non-hygroscopic and is available in both interior and exterior grades. ACS FCO has also been tested in accordance with EN13501 Parts EN13823: 2002 (SBI) and EN11925-2: 2002: Ignitability Test on softwoods, hardwoods, particleboard and others, achieving a rating of B/S1/d0 (equivalent to Class 0&1 to UK Building Regulations). To protect timber and timber related materials such as, softwood, hardwood, hardboard, chipboard and MDF (both fire rated and non-fire rated). ACS FCO can be used on a wide variety of structures and surfaces including, floors, structural timbers, timber framing, panelling, fascias, decking, soffitt board, fencing, sheds, summerhouses, scaffold boards and cladding (both interior and exterior). Ensure all surfaces are clean, dry and free of oil, grease, wax and organic growth, such as mosses, lichens, fungi and moulds. Remove any nibs, bark or splinters, make good any defects and fill knotholes with a suitable intumescent stopping (not Brummer) or timber plugs. Glossy surfaces of prepared timber should be lightly abraded with a fine grit Aluminium Oxide paper (+120 grit) or wire wool and swept clean or vacuumed. All existing decorative coatings and stains should be completely removed to expose the bare timber substrate. In the case of exterior applications, surfaces should be protected from rain, fog, frost, snow and surface condensation during preparation, application and drying. (Where paints or stains cannot be removed, see Product S92/FR or S92/FR/P Fire Retardant Coating). 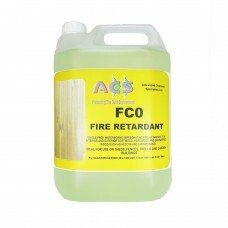 If a stained finish is required, see ACS FCO Timber Stain. Stir or shake the contents of the container well, before and periodically during application. Apply by brush, deep-pile roller or spray. Apply an initial coat to the entire surface and allow to dry for approximately 1 hour. Follow with further coats allowing 1 hour between applications, to achieve the final loading of 300- 350ml/m2 (2.8-3.3m2/litre). Adsorption rates and drying times will vary according to timber type, density and drying conditions. If treating decorative joinery, apply to an inconspicuous area first to check for shade change and grain raise. Full fire retardant properties will develop after 7 days. Once completely dry, if required, the treated surface may be over-coated with decorative stains etc. ACS FCO has a life–expectancy of between 5 and 10 years in exterior situations, dependant on the level of exposure. On interior surfaces, FCO should last for the life of the substrate. Do not apply to surfaces that are below 5°C, less than 2°C above the dewpoint or if the relative humidity exceeds 65%. Substrate moisture content should be below 25%. FCO may cause shade change on some species of timber, such as Sweet Chestnut, and we would recommend carrying out a trial application prior to commencing work, to ensure this lies within acceptable limits. This product is suitable for use on plywood provided the upper, treated laminate has a thickness of 2mm or greater. On hard surfaces, such as concrete and tarmac, run-off may cause a white stain to occur. Rinse with water before the stain dries. Dried stains will slowly disappear with weathering and traffic. 5 and 25 litres re-sealable HDPE drums. products, techniques and codes of practice are under constant review.